Ol Pejeta-Like rockstars of the conservancy, the Northern White Rhinos live surrounded by 24 hour bodyguards watching their every move. 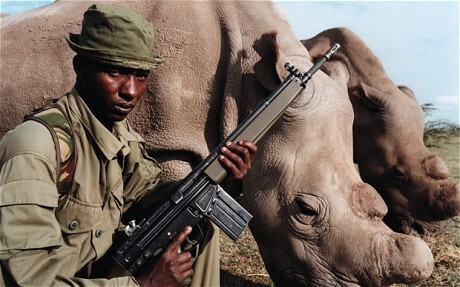 The four rhinos have an extraordinary relationship with the team of armed guards who lean on them, scratch them, and display affection for them. But the extreme desperate truth is that thanks to poaching, these are the last 4 Northern White Rhinos left on the planet. There are two males; 37-year-old Sudan and 31-year-old Suni and two females; 22-year-old Najin and her daughter 13-year-old Fatu. The rhinos were moved to Ol Pejeta as a final chance. It is the hope that the natural environment of the reservation will activate hormones in the two females, encouraging breeding attempts. Recently Najin and Suni were seen mating, which needless to say is remarkable news. The entire survival of their kind rests on them-the situation could not possibly be more urgent or tragic. The White Rhinos are divided into two sub-species; the northern (the four at the conservancy) and the southern. There are approximately 14,000 of the southern species left. Wow! Thanks to man, there are only four left. Unbelievable. When will some humans learn that every living thing on this planet servers a purpose? I often wonder, what will these poachers do, when there is nothing left to poach? I think once they destroy every living thing, they’ll turn on us and start taking out people. My thinking exactly! We must be kindred spirits.